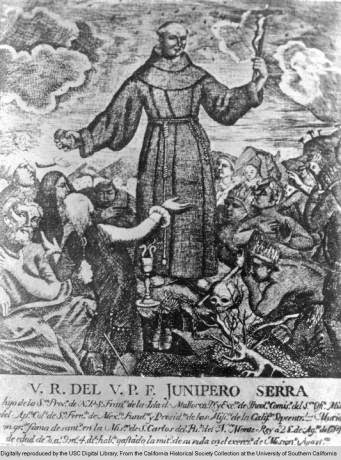 Pope Francis recently announced his intention to canonize Junípero Serra (1713-1784), the Franciscan friar remembered for his work among California Indian nations. From 1769 to 1782, Serra founded nine missions in California. Serra has been hailed by some as California's founding father and reviled by others due to his treatment of Native Americans; the pope's announcement has thus received mixed responses. Catholic news agencies such as the Catholic News Service have noted how surprised--and pleased--Serra's supporters were to hear this news, even while recognizing the contested nature of Serra's legacy. Steven Hackel, a professor of history at the University of California Riverside and author of books on Serra and the California missions, suggested that this moment might help to increase public dialogue about California's colonial history. Meanwhile, Indigenous leaders such as Anthony Morales, Chief of the Gabrielino Tongva Band of Mission Indians, highlight the destructive nature of the mission system for California Indians and argue that the pope should reverse his decision. Coinciding with this news, I thought I would share a CFP from the Comparative Approaches to Religion and Violence AAR program unit. While the geographical scope is open, historians of American religion, including those looking at the legacy of missions for Native American religions, might be interested in participating in the conversations this unit promotes. We are proud to announce that the Comparative Approaches to Religion and Violence has joined with the Journal of Religion and Violence. Future submissions to the AAR program unit will be considered for publication in the journal. 1. Religion, Law and Violence: a look into the role of international law, humanitarian law, and regulations of interventions such as in the Middle East. If you are interested in submitting to this theme, please contact Nathan French (frenchns@miamioh.edu) and Gregory Reichberg (greg.reichberg@prio.org). 2. Ethnographies of Religion and Violence: contemporary ethnographic analyses that track intersections between religious actors and violence, such as the role of religion in prisons, religious leaders in warfare, religiously motivated soldiers, or religious nationalists that foment violence. For possible panel inquiries, please contact Ryan Williams (rjw202@cam.ac.uk). 3. Comparative Ethics of Violence beyond Texts: We seek studies that trace the way that religious authority becomes enacted outside of traditional scriptural mandates, such as by cultural leaders, rituals and media. For possible organized panel inquiries, please contact Torkel Brekke (torkel.brekke@ikos.uio.no). 4. Martyrdom: We invite examinations into martyrdom as a performative, disputed, and celebrated category. 2. Religion, Ecology and Violence: we seek papers that examine cases such as eco-terrorism, environmental conflicts around extractive economies in Africa and Latin America, and the relationship between Islamism and petroleum economies. This panel is co-sponsored with the “Religion and Ecology” program unit. 3. Genocide in the Balkans: we welcome papers that look at acts of genocide in the Balkans. This panel is co-sponsored with the “Religion, Holocaust and Genocide,” program unit. 4. Cognitive Science of Religion and Violence: analyses of religion and violence through cognitive science methods and approaches. In addition to these suggested themes and collaborations, we welcome other submissions that fall within our program unit’s mandate.